Parchment : 1 sheet 60cm x 78cm with 2 wax seals, 2 signatures and revenue stamp. Francis HORDERN of Cheadle, Staffordshire. Druggist. Anthony HORDERN of Macclesfield, Cheshire. Druggist. Robert PHILIPS of Heybridge, Parish of Checkley, Staffordshire. Esquire. Smith CHILD of Rownall Hall, Staffordshire. Esquire. George FORD of Barlaston, Staffordshire. Gentleman. 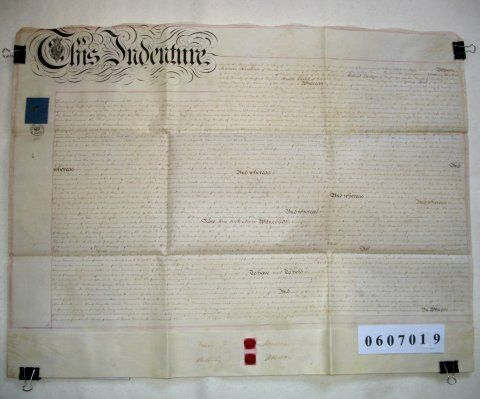 The Indenture relates to a mortgage on property in Stone, Staffordshire. It consists of 3 messuages, a malthouse and a number of parcels of land totalling 59 acres, all at Aston in the Parish of Stone. The document recites that in 1849 this property was mortgaged by Richard Clarke Hill to Francis and Anthony Hordern for £1000. Richard Hill died in August 1852 leaving all his property to his trustees - Robert Philips, Smith Child and George Ford. These trustees are now paying off the mortgage and the property is being conveyed to them. Note that in addition to this property at Aston, the Will of Richard Clarke Hill also mentions property in the township of Walton, and at Wardlow in the township of Farley, both also in Staffordshire.